You are my chew toy ! Gift art from Nelson and Victor, thanks to them again. "Did you do all your piddle, liddle pup ?" asked the dragon. The wolf huffed and nodded. "I don't think so." said Lubu before starting to tickles the feet of the little canine. "Nu-uh, you are my chew toy !" 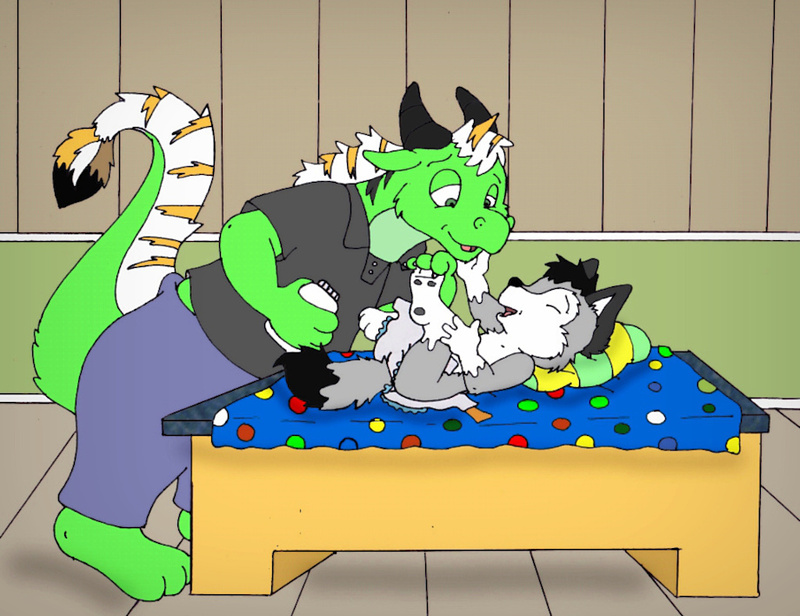 and the dragon started to pretend chewing on the toes, tickling the puppy more and more until he wets himself in giggles. "Here my little princess, now I can change you." said the caretaker. "Huff, huff I say !" answered the baby pouting. But as soon as the dragon had finished changing the puppy, he had to run to the potty himself because he didn't put a diaper on. Loupy giggled lots when the dragon didn't made it in time. "I guess, it's time now for me to change you, naughty hatchling. You are off for a spanking for wetting your pants like this, then you"ll be my royal mount." said Loupy. The dragon knew he was being punished like he deserved for forgetting his diaper. I had a really enjoyable week-end in diapers. The mood carried a bit to today : I've been having puppyish moments all day, and had to run to the potty many many times. Moments were things like wanting to say marf, thinking about playing with stuff, wear onesie and relax... I had also a dream about meeting grandpa and grandma to Canada but that can't happen. It's better only Mommy ever go there until she moves there permanently, then I can see to go. Yep, and mentioned the chew toy and the mount idea too. Now, to spanks, diapers and ride my dragon mount !